This was me after I returned home from SAGA convention. 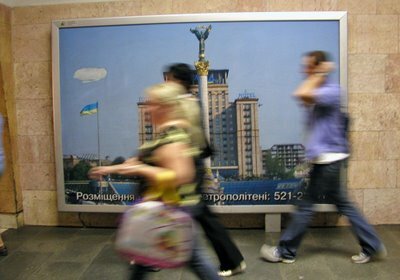 Except these people are walking too slow. 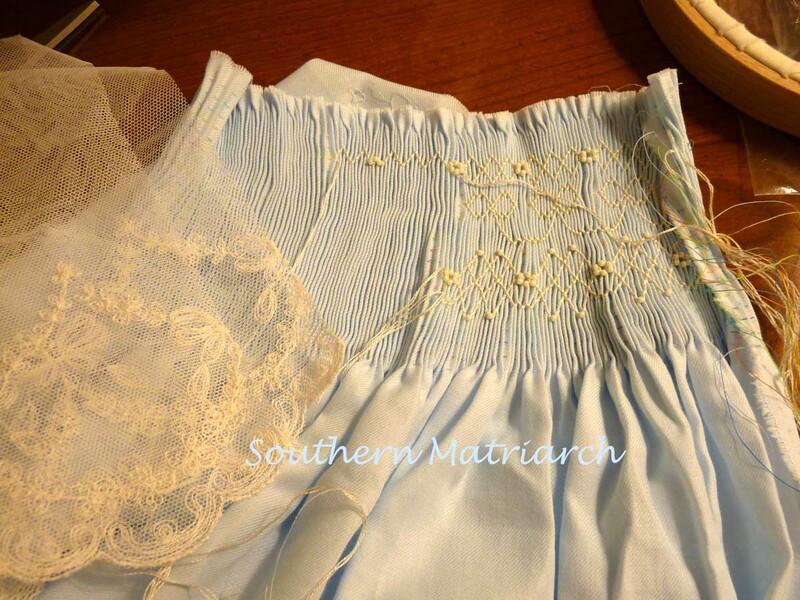 My feet hit the ground running and my fingers were flying to finish the christening gown. After all of the rush was over, I realized I never shared with you, faithful reader, about my classes or any pictures of the wonderful time I had in Norfolk. I did describe my first day of class here, with all of its typos, but no pictures. My first class as I reported earlier was Beautiful Bows, with Judith Adams. This is not the best picture of Judith, but I wasn't on my A-game that day. Remember, that was the day I had to go to the dentist. This is the sample for the class. Judith's dress is made from teeny pique. The over lay is English netting. So pretty. This is my project. I have taken it on my trip with me. I got pretty far considering I missed half of the morning with an unknown dentist in my mouth. It also helps that I am only making a size 6-9 months. I only have one row of bows. I am sure it will be smocked before I return home. There isn't much left to do. The fabric I chose is Swiss flannel in a light blue. I was in a rush and it was what I grabbed from the stash. Plus it pleats like butter. It looks really nice with the champagne colored English netting. It will be a pretty dress for our baby. 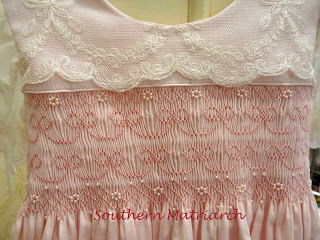 What a pretty smocking pattern! I love that English netting! That should look lovely. 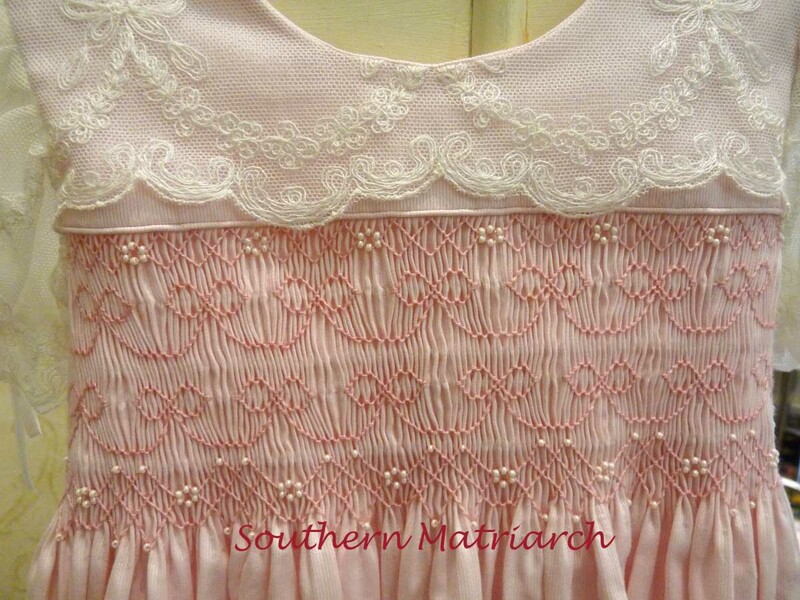 That is a great smocking pattern and the lace collar is gorgeous. Your baby will feel rich. Beautiful dress! Pink is my favorite color. This is so lovely. CWTS it done and on Baby Eva. That is gorgeous! I have never seen Swiss flannel. I have been afraid to try it due to the "flannel" part of the name! lol What kind of texture does it have?Will it pill like flannel? Thanks. I can't wait to see your finished product. I LOVE blue and ecru/champagne!